Student competitors with their respective Soldier volunteers. From left, Ryan Price, Billy Clark, Nina Ray and Nikkita Antonelli. NETZABERG, Germany — Two students from Netzaberg Elementary School participated in Germany’s Special Olympics Dec. 4in Kaiserlauten. Students William (Billy) Clark and Nina Ray both won first place and the gold medal for their age group (11-12 years old). In bowling Billy scored 114 in and Nina scored 75, impressive scores since this is the first time that both participants competed in the Special Olympics. Each student had a volunteer Solider, Ryan Price and Nikkita Antonelli, help the two students with their events. The Soldier volunteers were there to help with encouragement and guide them along the competition. The Special Olympics overseas was created for individuals with moderate to severe disabilities to include physically impaired. 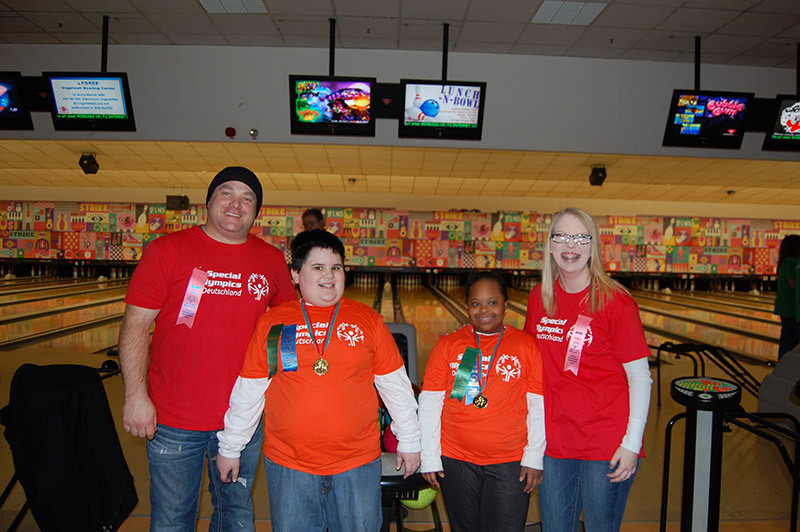 The Special Olympics are held in December for bowling and in the spring for track/field. The events are held through on going donations from squadrons, distributors from DECA, the spouses clubs and other private community organizations, said Wanda Castillo, the Special Education Teacher at Kaiserslautern High School. Last year students were supposed to take part in the event but had to cancel at the last minute due to construction. “I am very proud of these two students and am happy that they enjoyed themselves” said NES teacher, Stephanie Gannon. Contact the school if interested in learning more on how you can help or volunteer.